Is there a better alternative to FastMailBase? Is FastMailBase really the best app in Email category? Will FastMailBase work good on macOS 10.13.4? FastMailBase works in tight conjunction with your favorite eMail client by importing selected eMails from it to store and organize them in a lightning fast database for later powerful search and management. FastMailBase will remain in demo mode until you provide a valid registration key, with full features available but only limited to 100 emails import. As soon as registered, this limitation is removed. 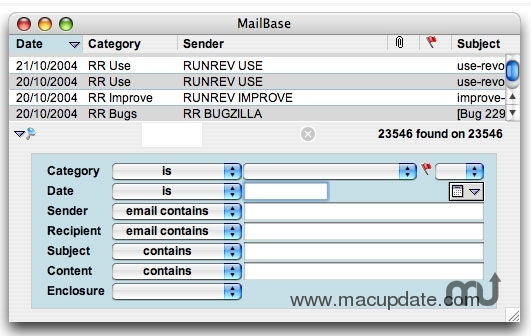 Mac OS X 10.2 or later, and a supported email client (Apple Mail, PowerMail, Microsoft Entourage, Microsoft Outlook Express, Claris Emailer), or any mbox capable mail client. Classic Mac OS 9 version 1.1 is available here. FastMailBase needs a rating. Be the first to rate this app and get the discussion started!